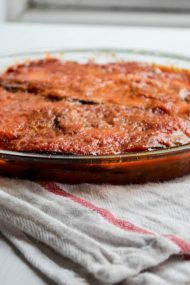 Is it too daring to share an eggplant recipe with fall nipping at our heels? The craziest cold spell fell upon us earlier in the week, leaving Isabella and I huddled together under my shawl at Rosh Hashanah services on Monday. A bitingly cold, wet day of pouring rain nestled between 75 degree days. By Thursday, though, we were back to humidity thick as mousse. So it goes this time of year, as the offerings at the farm stand echo the seasons dribbling from one to the next. Maybe we’ll see tomatoes strewn across the table for another week or two. There’s usually a moment of silence between summer produce shedding it’s last harvest and fall favorites arriving. I suspect they’ll overlap closer this year since someone told me it was the fourth hottest summer since record keeping. Could that really be possible? I must remember to check into it further. 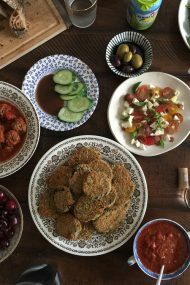 I hand over this Creamy Eggplant Hummus recipe somewhat reluctantly, for fear eggplant is no longer available when you read about it. Should that be the case, tuck this away for next summer. It’s one you certainly want in your life. Creating it happened on a whim. There I was sitting at my desk in the living room, area really, since it’s also occupied by the dining table, sofa, and television. A cozy little house, indeed. My plans were to meet a friend for tea, possibly lunch at 2pm. In the meantime, I decided to pop a couple of eggplants in the oven to roast, and turn into baba ganoush later that afternoon. Come half past noon, hunger hit hard and fast. My craving for straight up baba ganoush morphed into thoughts of hummus, so one might say if the two had a love child, it would be this Creamy Eggplant Hummus. Or should I call it a dip? You’ve no idea how many times I’ve contemplated this question in the last 24 hours. It irks me when people use terms out of context. For me, hummus means chickpeas. There’s a handful in here, but they play more of a supporting role. On it’s own, this Creamy Eggplant Hummus is good, but to be completely truthful, it’s all about the toppings here. Serving it alone is akin to wearing a little black dress with nary an accessory. 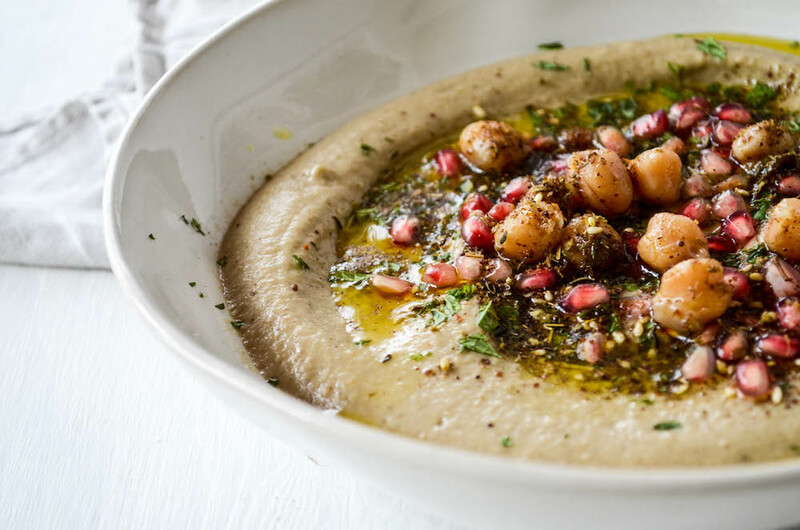 The garnishes—chickpeas, mint, pomegranate, za’atar add flavor and texture, elevating a simple dip into a rather extraordinary appetizer. One might even call it lunch, as I did the day I made it before running out the door. 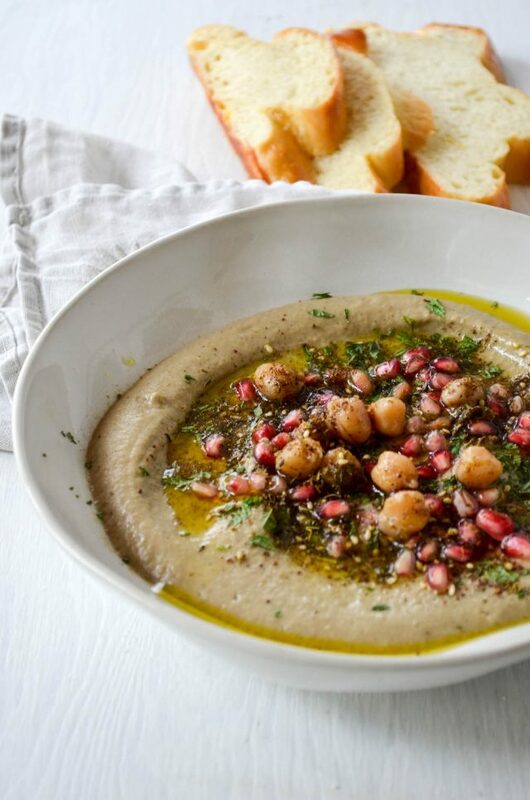 Canned chick peas can be used if short on time, though they are less flavorful, so you might want to boost the flavor with more cumin, use the full amount of tahini, and swap in vegetable broth for the tablespoon of cooking liquid (water can be used, too, in a pinch). If not serving right away, store dip in a covered container in the fridge. Let come to room temperature before adding garnish and serving. If you love roasted garlic, go ahead and add an entire head to the pan. Use what you need for this recipe, and store the rest in a covered container in the fridge, Use as needed, within 1 week. 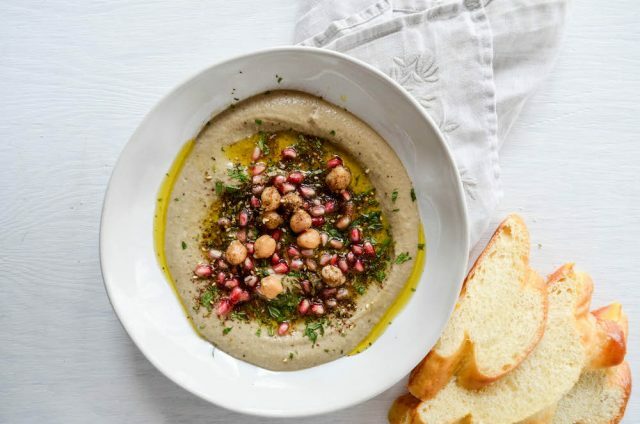 Creamy Eggplant Hummus Prep time: 5 mins Cook time: 1 hour Total time: 1 hour 5 mins Serves: 4 A perfect appetizer for parties, serve this creamy eggplant dip with pita, whole grain crackers, or challah bread. It would also complement grilled steak or roast chicken. 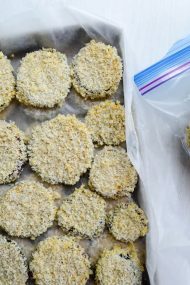 Add the eggplants to a rimmed baking sheet. Bake at 350ºF for 30 minutes. Add the garlic to the pan. Bake for 30 minutes more, until eggplant is very soft when poked. It’ll collapse and shrivel a few minutes after coming out of the oven. Let cool. Once cooled, slip the skin off the eggplants, and peel garlic (it should easily pop out). Add the eggplant, garlic, tahini, lemon zest & juice, chickpeas, cooking liquid, and cumin to the bowl of a food processor. Pulse until everything is thoroughly broken down. Season with salt and pepper. Process until very smooth. Spread the dip into a shallow serving bowl. Garnish with a generous drizzle of olive oil. Top with mint, pomegranate seeds, and za’atar. Serve immediately. Looks great! I love baba and hummus. I’ll have to check on eggplant at the farmers’ market this week! Thanks for the recipe.